The Winnipeg Jets no longer carry a heavyweight fighter on their roster. As of this writing, they haven’t had one since Chris Thorburn. And yet, they’re regularly described as one of the toughest, hardest to play against teams in the NHL. The definition of toughness in hockey is changing. The Jets set a franchise low for fights this past year with eight. Heck, they had more fights than that in the 2011 preseason. Matt Hendricks, who is unlikely to return, accounted for five of them. Yet nobody would ever accuse the Jets of being soft. They’re regularly praised for their physical style and toughness. It’s a known fact league-wide: if you come into a game with the Winnipeg Jets, be prepared for a tough matchup. Personally, I miss seeing the occasional fight in a game, but regardless of my feelings on the matter the Jets were tough when fighting was still a big part of their game, and they’re tough now. But which Jets are toughest? There are a lot of ways to judge toughness. Physical play and a willingness to both give and take on that front is one. Shot blocking, playing through injuries and, yes, fighting, are all measures of toughness as well. The Jets nominee for the Mark Messier Leadership Award is coming off the best offensive season by any Jet since relocation. His offensive prowess is well known and often overshadows his grit. Wheeler is not necessarily tough in the old-school sense, but he hits hard on the forecheck, fearlessly blocks shots, and does anything necessary to win. And yes, that includes fighting on occasion. Wheeler had no fights this past season as he was too busy scoring goals and setting career highs in assists and points. He’s not unfamiliar with fighting, as his scrap with Evgeni Malkin proved last season. Wheeler’s fast-paced, no-holds-barred game would leave most players in a heap at year’s end, but Wheeler has been remarkably durable. He’s missed just six games in seven seasons as a Jet. Considering the style he plays, that makes him one tough hombre. Trouba might not be as durable as Wheeler, but he is Mean with a capital M. His open ice body checks are jarring and at times vicious. He’s no fun to play against in the corners either. In that sense, Trouba is a bit of a throwback. In his draft year he was likened to Adam Foote, and while he’s not quite that level of junkyard-dog mean, he’s a better skater and puck handler. His hits have at times been borderline, or even over the border. Any player who plays the way Trouba does has to be prepared to answer the bell at times. Trouba has been more than willing to do this, and also prepared to make other teams answer if they cross the line, such as when he challenged Washington’s Michael Latta following a dangerous hit on Scheifele. Trouba blocks his share of shots (he blocked over 100 this year) and plays the game with his shoulders as much as his hands. If the Jets are wise, they’ll lock their nastiest defenseman up long-term this summer. Watching Morrissey grit his teeth and grimace his way through the playoffs after blocking a barrage of shots and not missing a shift should give you an idea of how tough he is. In fact, he’s one of just two Jets with over 100 hits and blocked shots last year. The left head of Winnipeg’s two-headed defensive monster with Trouba is nearly as mean as his partner. Craig Button once compared Morrissey to Niklas Kronwall, and TSN’s director of scouting may have a point. Like most of the players on this list, Morrissey is not tough in the old-school sense. That is to say, he’s never had an NHL fight and his only AHL fight came after he was jumped following another Kronwall-style hit. Even his WHL fight card is sparse. But any player for whom ice baths and sore limbs are a regular part of the job is tough enough. With his bruising hits and fearless shot blocking, Morrissey somehow still managed to play all but one game his first two years in the league. He’s tough, all right. Lowry is perfectly capable of defending himself or his teammates with the gloves off. He just doesn’t show it very much anymore. My enduring first impression of Lowry was at the rookie tournament in Penticton, where he put a thumping on Bryce Van Brabant of Calgary. A somewhat frequent fighter in his WHL days, Lowry has focussed on other aspects of his game in the pros. Still, his toughness with his gloves off is well enough established. And that’s before you consider the bone-crunching hits on the forecheck. There may not be a more intimidating Jets forward than Lowry. Brandon Tanev earned some consideration for this list, and he had more hits than Lowry this year, but Lowry’s 124 hits came in just 45 games. If that weren’t enough to cement his toughness, he played in the playoffs with two dislocated ribs. An intimidating forechecker unafraid of the fisticuffs and willing to play through gruelling injuries, Lowry is a tough man indeed. He might be the toughest man on the Jets but for the next player, and you knew it was coming. No conversation about the Jets toughness is complete without Big Buff. He throws bone-rattling hits, isn’t shy about shot blocking, and is an instant equalizer in any scrum. It will be a long time before anyone forgets him, on several occasions, manhandling two opponents at once in skirmishes in the playoffs this past year. Some of that toughness comes from his size, but big players don’t always play big. Byfuglien does. In fact, at times he seems to play bigger than he is. Even for a man of his immense build, Byfuglien is incredibly strong. Players who hit him look like they’ve hit a wall. 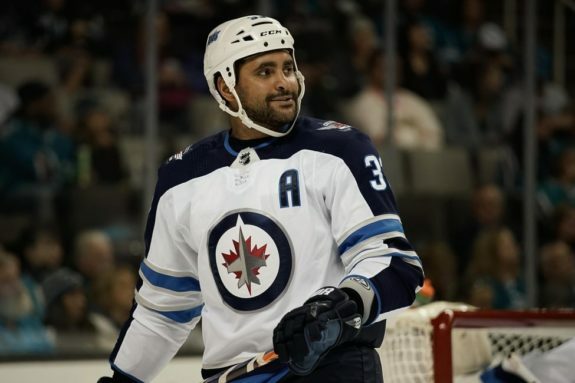 Byfuglien is not only tough but a key cog in the Jets machine as well. 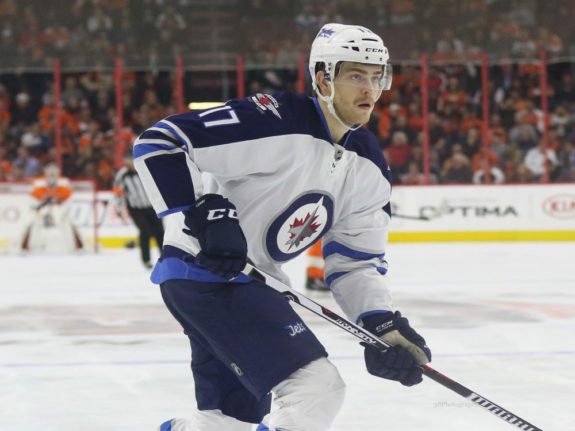 When he’s rolling, the Jets are a much better team for it with an entirely different dynamic. There is only one of Byfuglien in the NHL. No other team has anyone even close to like him. While fighting is not his forte, he has shed the gloves with Luke Gazdic, Jamie Benn, and Matt Martin in recent years. Byfuglien has had a smattering of smaller injuries but has never lost more than 16 games out of a season. 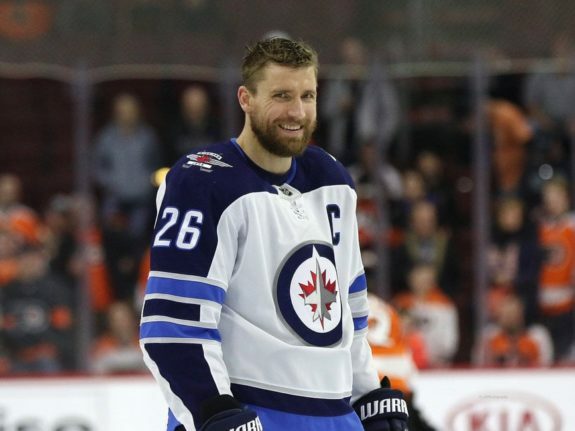 As the second-leading hitter on the Jets, and as the most intimidating player in the NHL, he is unquestionably the Jets toughest player. We’ve used the expression “old-school tough” in this piece a few times, and that sums up Brendan Lemieux. 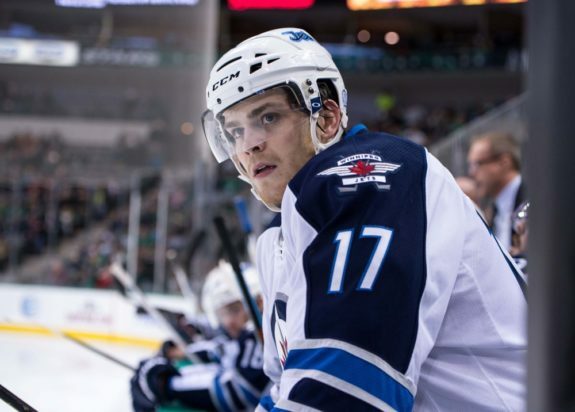 Willing to take on all comers, he’s a frequent fighter and always among the Manitoba Moose leaders in PIMS. Lemieux’s bodychecking is a well-developed skill, as is his agitation. He’s tough, no doubt, but he’s not a full-time Jet yet. He could well be this year, but that hasn’t happened and until it does he’s one of the toughest members of the Moose, not the Jets.